Each year, committed art and design students are invited to share a private studio space to complete an independent project of their choosing. The studio is small but the creativity is larger than life. In room 110 in the Bush Art Center, art students are taking full advantage of a one-of-a-kind opportunity that allows them to dig deep into the crevices of their imaginations. Across the room, they pick up brushes, cameras, tablets: exploding color across canvases, reimagining narratives and even inventing their own mythology. On one side of the room, a project of cardboard and colored Sharpies. On the other, a Photoshop file bursting off the page with a fresh take on advertisement design. And in between, there’s no telling what else these student minds may spill next. This is the Student Studio project, where committed art and design students at SNC are invited into a private studio space to complete an independent project of their choosing. The year-long project is one of the most innovative and portfolio-building opportunities the department has to offer. It gives students a place to let their artistic ambitions run wild, an opportunity to complete professional work among peers and a chance to develop a concept that means something personally to them. Students interested in participating in the project must first complete a proposal for their intended body of work, including the purpose of their work and the timeline they wish to follow. If chosen, they will receive a key to the studio where they will be able to work and store their materials. All participants must exhibit or present their work by the end of the school year. This can include showing their work in the Senior Art Exhibition if they are graduating, presenting in Bush’s Clubhouse Gallery or participating in an off-campus gallery. 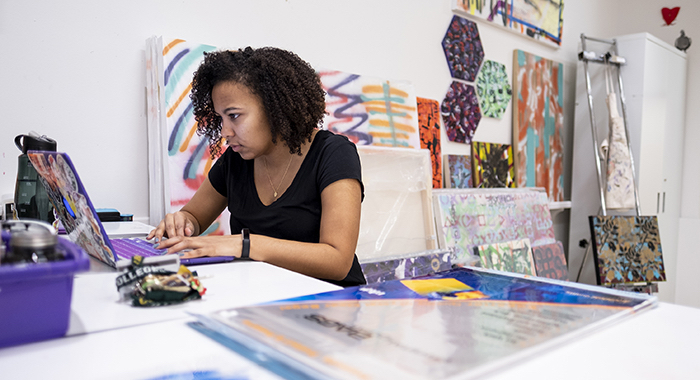 While the art department offers programs that include printmaking, painting and graphic design, the Student Studio does not fall into any one category. It is a workspace, not a class: a privilege assessed not by grades, but by the meeting of personal goals. Members are required to present their progress at the end of the fall semester or risk being asked to leave the program in the spring. This halfway-point progress is assessed by art profs Debbie Kupinsky and the Rev. Jim Neilson ’88. This year, seven students were accepted into the limited studio space: Hopkins, Annabelle Broeffle ’20, Bridget Van Beckum ’20, Elizabeth Hein ’19, Emerson Bartch ’19, Maddie LeBrun ’20 and Nicki Sylvain ’19. While these emerging artists may share a room, they have each raced off in their own direction on their projects and are hard at work. Sylvain’s project, which she describes as “large-scale contemporary abstract works,” uses layering of patterns, explosive color and complex symbolism to create acrylic- and spray-paint hybrids. Recognized by De Pere gallery artlessBastard for her “bold, distinct typographical aesthetic,” she presented a solo show at the gallery this January. Hopkins is currently working on a particularly practical project for her third year in the studio – getting into graduate school – but recalls all of her time in the space as a place for personal and professional growth. 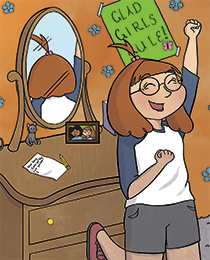 In her second year, she used the space to create illustrations for “Gladys Pearl, the GLAD Camp Girl,” a children’s book about SNC’s summer leadership camp for girls. The 10th anniversary of St. Norbert’s leadership camp for girls gave GLAD mentor and Student Studio artist Katie Hopkins ’19 an early chance to fulfil her dream of illustrating a children’s book. Hopkins’ charming images helped bring to life “Gladys Pearl, the GLAD Camp Girl,” available in the college bookstore. Pictured above, Gladys repeats the GLAD Camp pledge.